Holy hell do we need to talk about We Need To Talk About Kevin. Every so often I fall deeply in love with a movie. I have been completely swept off my feet by this one. Just watched it for a third time and don’t want to send it back. I realize that it will be very difficult for me not to oversell this one. Apparently I already have as “the soon to be wife” and my own brother have both told me as much. Before I go any farther I should say this, stop reading if you have not seen this. I wouldn’t be this thrilled had I known any more than who was in it. To borrow a phrase from an old colleague, “More Mystery, Less History” can go a long way with this one. No trailer either. I made that mistake with the girl, thinking she would never see it, and then immediately demanded that we spend the next 112 mins. doing just that. Be warned that this is at times intense, at times uncomfortable and has been referred to as a psychological horror film and even as a War Film by Tilda Swinton herself. Speaking of Swinton, this is the best I’ve ever seen her and that says a lot. Now don’t go any further unless you’ve seen it or if you like to not enjoy great movies, but only read about them. Shot in gorgeous anamorphic CinemaScope, Kevin kicks off with confusion and disorientation and doesn’t give the viewer firm footing until about the midway point. This is not to say that it was anything less than compelling which is so often the case with nonlinear story telling. Scottish director Lynne Ramsay (who I am now in awe of) took 9 years to follow up Movern Caller ,which is now streaming on netflix instant, review coming soon. I have to think that she spent much of that time piecing Kevin together as there are so many moving parts and attention to detail that I have not seen in recent memory. Not since Elephant (coincidentally also about high school violence) have I felt like I was inside some kind of a visual puzzle that my mind was struggling to make sense of. There are only a couple negatives that keep me from calling this a perfect film. One is the age difference between teenage Kevin and his younger sister. We first see them together when he was about 7 and she was a newborn. Cut to he’s 16 and she’s 5. Next is John C. Reilly’s oblivious state throughout. This hole is somewhat filled however in the DVD extras, speaking of which. If you liked teenage Kevin, Ezra Miller, don’t watch the DVD extras. It’s probably unfair to criticize the character of a 19 year old fine actor, but he posses all the worst parts of Kevin’s character and none of the charisma. Blow hard teenagers with vocal burn are rare and I’m thankful for that. Brilliant performances are also rare and Ezra’s is exactly that. 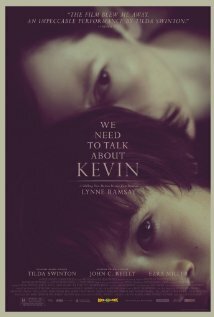 All 3 of the Kevins were remarkable and the movie would have suffered if they hadn’t been. The book We Need To Talk About Kevin was a huge success overseas, but not so much over here. Same was true with the film. I wish this was not the case. This should have been up for best picture last year, Ramsay definitely deserved a best director nomination for the brilliant subtlety and at the very least I should have been alerted to see this on the big screen. Shot in widescreen anamorphic as stated earlier, I would have loved the opportunity to see this portrait of an American family gone wrong in a format usually reserved for sweeping war epics. Tilda did call it a war film though, so perhaps it wasn’t unusual after all. Posted on Wednesday, September 26th, 2012 at 1:01 am and is filed under Reviews.